I make this lasagna a lot and it’s always a huge hit. It puts a sparkle in peoples eyes. It casts a spell. You can get them to do anything just make sure you make enough for seconds. Now, before my beloved Italian friends raise hell, I know this has nothing to do with a traditional Italian Lasagna. Primarily because it calls for mascarpone or ricotta and does not include a bechamel or ragu sauce. It might make some Italians cringe like I cringe when I see someone making tabouleh out of couscous and even worse, with only a sprinkling of parsley! That’s called couscous, not tabouleh. But, that’s a topic for another day. I use ricotta in the summer, for a lighter, more bikini-friendly version and usually I serve it cold. The lasagna pictured above is ricotta based and was taken in the summer. I’ve had no opportunity to post it till now. Come winter, when I’m drowning under layers of clothing I crave richer, more hearty, soul comforting food and that is where the mascarpone comes in. Pre-heat oven to 325F/160C/3G. Lather salmon with a tablespoon of olive oil and the garlic. Bake in the oven for 15 minutes. Flake the salmon. Remove skins. Sautee the leeks for a minute and then add the mushrooms. Cook for a further 1-2 minutes. Take of heat and strain to remove the extra juices. Add all the cheese, tarragon and milk in a deep bowl and puree with a hand blender. Spread a couple of tablespoons onto the bottom of the baking dish. Add the lasagna sheets. Make sure they overlap each other. I used 4 sheets on each layer. Cover the layer with cheese sauce again, about 2-3 tablespoons. Layer with half the flaked salmon. Now half the mushrooms and leeks. Cover with about ½ cup of the sauce. 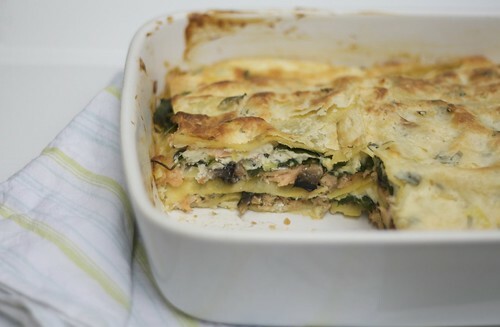 Repeat layering with remaining salmon, spinach, mushrooms and leeks and then lasagna sheets. Cover with remaining cheese sauce and sprinkle with shredded mozzarella. Bake in oven for about 45 minutes at 325F/160C/3G. Did u go to cooking school? u make everything look just too easy! id love to try this! My mum makes the best lasagna but she uses a bechamel sauce. I will try this. Sounds yummy as i love mascapone a lot! this is one of my favorite dishes but i always get commercial prepackaged. anyways its on the top of my to do list now! I’m going to try and make this for my guest this evening. Thanks. Yet again such clever ideas……. can’t wait to try! Wow, I just made this. I got your recipe off of Twitter, I am “aupaw.” My normal way of approaching recipes from the internet is to make it exactly how the writer says and then tweek it from there. I had to convert the measurements because I am in the US, but seriously….I would not change a thing. Yum, it is the new go to guest dish. I made it with mascarpone, I will try ricotta next time. I would say more..but I am too busy eating it. I love fish with lasagna or any pasta and this looks fabulous! I love salmon and I know this will taste as good as it looks. I love salmon AND I love lasagna. I didn’t know one dish could be soooo tasty. The combination is excellent!! What a great version of lasagna!! It sure looks delish! That looks amazing! I’ve never cooked with fresh tarragon, and I don’t think I would have thought to use salmon in lasagna. I will definitely have to try this sometime. Tarragon and salmon are a natural pair…a nice, lighter lasagna offering. Any left? This looks absolutely delicious… I’m in the process of making it but I’ve already screwed up. Couldn’t find fresh tarragon for starters so had to make do with the crappy dry kind.. and I think my dish wasn’t deep enough. Actually, I know it wasn’t deep enough cos all the cheese started spilling out….. and right now, as I type, my whole house is filled with smoke cos the cheese fell into the fire! Hubby is giving me dirty looks. Let’s hope the taste makes up for the mess I’ve made!!!! Tried this last night & its an absolute treat – Will def. make again! Thanks for sharing the recipe!! Had guests over and they loved it & took the leftovers home after we all had seconds! – Did not cook the salmon beforehand, just sliced it and mixed it in a bit of olive oil & minced garlic. This was because i had crazy fresh salmon & normally feel bad if its cook too much… given the lasagne is baked ~45 mins my only fear was it would make the lasagna too wet! But it didnt!! – The spinich i poured some boiling water on top in a colander & then squeezed out the excess water. This was my blind hope to offset the water from the fresh salmon. – I had 2 elderly, so i used half low fat ricotta & half mascarpone, only in attemp to reduce sugar. other than that, per the portions & instructions and flavours were great! was not heavy at all & well balaced.